I'm not sure when exactly this was taken, but I suspect it was sometime in the late 1980's or early 1990's. This was my workspace in the northwest corner of the studio -- note the cork board with all of the COMMANDOSAURS art in the background, and the classic homemade drawing table constructed from a hollow-core door mounted on a frame made with two-by-fours (and maybe a few two-by-sixes). If I'm remembering the layout of the room correctly, looking straight ahead from my spot I would see Jim Lawson, then further down Kevin Eastman and Eric Talbot. To my left, Ryan Brown and Steve Lavigne had their work spaces. I know Mike Dooney had a space here, but I can't remember where it was. (I think it was next to Jim's... I'll have to ask them.) I think Steve Murphy may have also had a desk here, but I could be mistaken. it's funny, when I first looked at the photo before I'd read everything I thought the thing hanging from your lamp was a new lint roller where the sticker hadn't been removed yet. Anyways very cool entry, this was always one of my favorites from the old Planet Racers site. I really like looking at how different illustrators work. 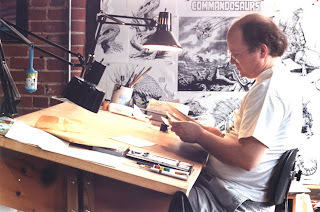 could you show more COMMANDOSAURS art? -->> aahhh , cute Baby story too! !